We have statistics which shows most vulnerable programs for this year. Between them we can find Microsoft Internet Explorer, Mozilla Firefox, Google Chrome, Java, Adobe Flash, Adobe Reader and Microsoft Office. Experts say that Microsoft Internet Explorer get more security updates than others, but as you can see from graphics it still has plenty work to do. IE11 updates released much more often than in previous years. What about web browser plugins? In this case Adobe flash player is the winner. 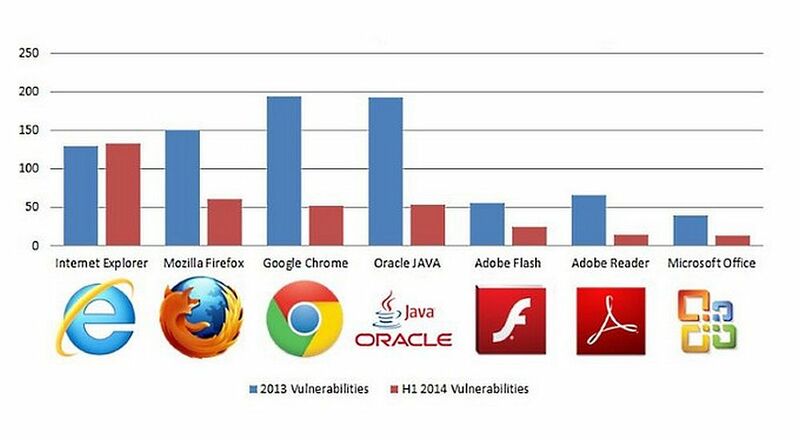 Last year hackers found vulnerabilities in each adobe flash version released. This year situation is a bit better, but flash still needs to release security updates. This year most hackers attacks targets stays the same. They use Flash player, Microsoft Internet explorer, Java runtime and Microsoft office library security vulnerabilities to hack into your computer. How to prevent this? Computer repair Ltd recommends to keep all your programs up to date. As you can see from graph how many security holes were fixed in 2014.